Mustard is a spice known for its flavoring capabilities and therapeutic value. Mustard leaves are used as a salad or vegetable; in India mustard is used as an oilseed. It is also used for industrial purposes. Globally, three types of mustard seeds are used as condiments: Yellow (Sinapis alba), Brown and Oriental mustard (Brassica juncea). Canada is the world’s largest exporter of condiment mustard seed, supplying both Yellow and Brown/Oriental mustards to the world trade market. 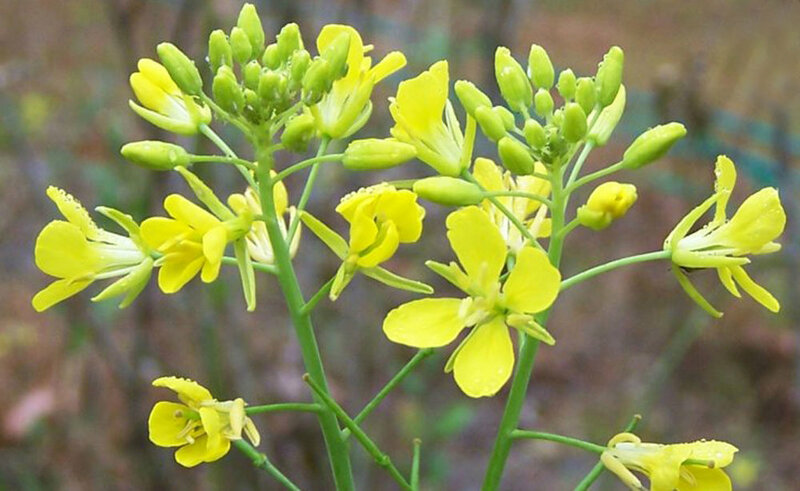 Carinata (Brassica carinata), also in the mustard family, is being developed as a dedicated industrial oilseed crop. Mustard production in Canada is concentrated in the drier, southern prairies, where drought-tolerance is needed for crop success. The mustard breeding program at Agriculture and Agri-Food Canada (AAFC) is driven to improve the genetics of new varieties. Limited options for managing hard-to-kill broadleaf weeds pose a major challenge for mustard production. The lack of new herbicides registered for use in mustards is a serious concern that Mustard 21 (M21), AAFC and their collaborators will be addressing in the planned research with the Diverse Field Crop Cluster. M21 will have a major research focus on the feasibility of incorporating several diverse crops, including mustards, into the major crop rotations (cereal, oilseed, pulse) to determine how they will influence pests, water use efficiency, soil nutrients, crop and soil productivity, and carbon footprint. Development of improved N (nitrogen) management practices is crucial to lowering the carbon footprint in oilseed crops. Mustard seeds contain protein, oil, carbohydrates, and micronutrients. Additionally, mustard contains bioactive compounds such as glucosinolates, phytate, and phenolics, which are now being investigated for their potential in industrial applications and for their health benefits. Glucosinolates are important natural components in mustard as their breakdown produces isothiocyanates– the agents responsible for the heat, pungency and natural antimicrobial properties of mustards. Mustard protein has an excellent nutritional profile: rich in lysine, with higher methionine and cysteine levels than most cereal and oilseed proteins. This high biological value makes mustard a protein source of interest for human nutrition. Mustard is a diverse commodity– it can be processed into various forms including whole seed, cracked seeds and finely or coarsely ground seeds. It can be milled to produce flour and bran, and de-oiled to produce an oil fraction and a high protein meal. Mustard has unique functional properties that can be applied to many foods including baked goods, packaged meat products, condiments and emulsion-type dressings. Depending on the type of mustard ingredient used, mustard provides emulsification, stability, water and fat binding, preservative and nutritive properties to foods. Coming soon… Watch for the launch of the first Brown Mustard Hybrid variety with yield increases greater than 15% – developed by Agriculture and Agri-Food Canada’s Saskatoon Research and Development Centre and licensed to Mustard 21 Canada Inc. for commercialization in North America. Mustard 21 Canada Inc. is the research and development arm of the Canadian Mustard Association and the Saskatchewan Mustard Development Commission. M21 focuses on long-term strategic research priorities to develop globally competitive varieties and value-added products. M21 leverages Canadian mustard value chain investment to support projects important to Canadian mustard growers and processors.